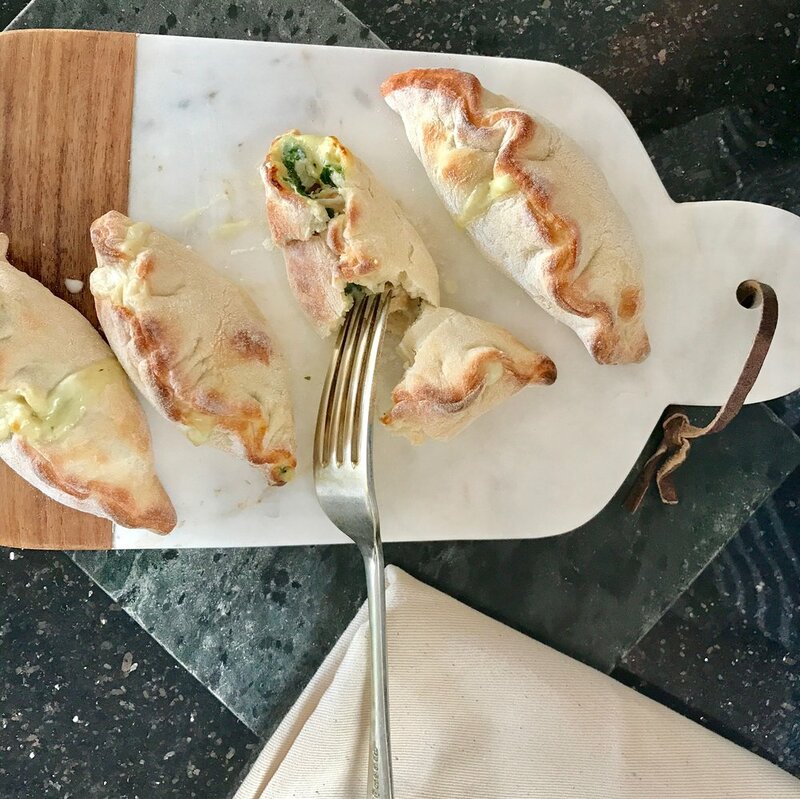 SMOKED HADDOCK AND CREAMY MUSTARD CALZONES — NORTHERN DOUGH CO. If you love fish pie, these are a must try, they’ve become a regular favourite with us. Smoky, creamy and with a subtle mustard kick, they’re perfect for a starter or light lunch served with a fresh green salad. Pre-heat your oven to its hottest setting, and lightly flour your worksurface, rolling pin (if using) and baking tray. Roll or stretch your dough to approx. 10-12 inches in diameter, and cut four circles using a large cookie cutter of around 10cm in diameter (or use a small upturned bowl as a guide and cut with a knife). You can make doughballs with the leftovers so none goes to waste. Mix the crème fraiche with the grain mustard and place a dollop of the mixture in the centre of each circle, leaving a wide area around the edge of the dough, then put the smoked haddock directly on top, and sprinkle with parsley. Bring the edges of the dough together, to form a semicircle shaped pouch, being careful not to squeeze out the filling. Pinch tightly together to form a seal all the way along the edges, making sure that there are no holes or gaps. With the sealed side facing up, place on a lightly floured baking tray and move to the hot oven for 5-6 mins, checking regularly towards the end of the cooking time. Your calzones will be ready when the crust has turned golden brown. Allow to cool for 3-4 mins before diving in as the contents will be very hot. Serve and enjoy!